Have you ever gone into your attic on a hot summer day? Or have you had the misfortune to have to do some kind of work up there when the temperature was 130 degrees or higher? The intensity of the heat that builds up in attics is astounding, and can literally take your breath away. Just think how hard your HVAC system has to run to overcome that heat beating down on your ceilings! 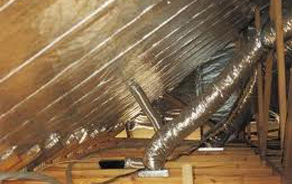 And if your A/C ducts are in the attic, it is an even bigger problem because the air inside the ducts is likely getting much warmer before it can get to the upstairs rooms. New construction roof decking that has a foil coating already bonded to the underside of the OSB board. 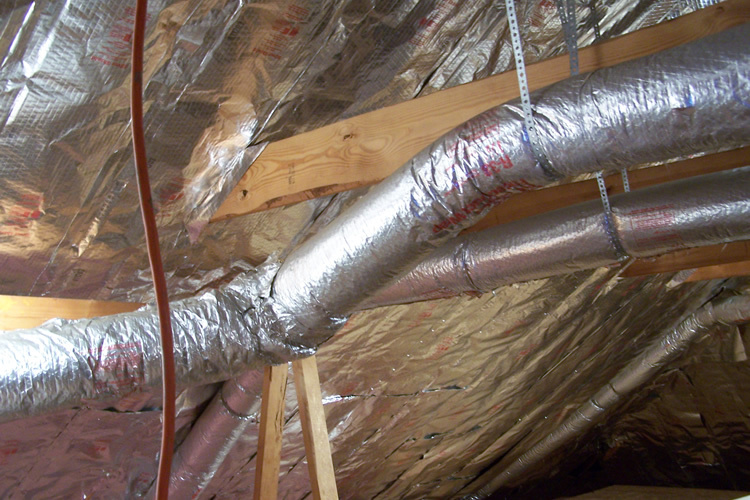 A large roll of foil that attaches to existing roof framing. A paint that coats the underside of existing roof decking. The temperature difference after the radiant barrier is installed is unbelievable. When we are installing the barrier in existing homes, we even notice a huge temperature difference from one side of the attic that already has the barrier up, and the other side that we haven’t finished yet. People often ask if radiant barrier can damage the roof shingles. Studies have shown that radiant barriers only increase roof shingle temperatures by 2-5 degrees, an insignificant amount compared to the high temperatures that shingles endure every summer. The cost of installing attic radiant barrier for new construction is around $500 in the East TN area, depending on the roof surface area. For existing homes it can vary according to whether homeowners do it themselves or contract it out. Working in the attic and getting to the roof deck areas is not easy or very safe, and most homeowners feel it is too big of a project unless they have construction experience. 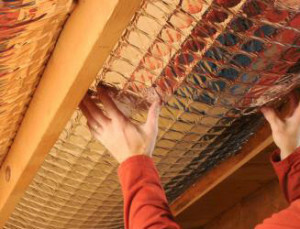 Green River offers radiant barrier installations. Now is a good time to do this project, before the hot summer sun starts beating down on your home! Call Us Today For A Free Estimate Or Consultation, (865) 919-7464.